I'm (Lea) challenging you to create a project using the ever trendy camera theme! There are so many great camera themed products out there currently, and I want to see how you use them with your Winnie & Walter stamps (and/or any other products regardless of brand). I can't wait to see what you create! FABULOUS card, LOVE your COOL camera, pretty layers & colors, LOVE your splash of sparkle too!!! FUN challenge, time for me to put my thinking cap on, usually I'm the one using the camera, not creating with one, so I will have a search of my stash and hopefully be creating a card to take up the challenge soon!!! Beautiful and fun card, Lea. I love the layers and flash of the pop of glitter! Makes me want to "SMILE". I;m going to have to think about this challenge, I have no camera stamp yet . . . . . . . I must use my brain this early in the morning? Thanks for sharing! Cool card Lea! Love all the layer. Happy wind! I loved it lot..Wonderful pp, layering n yes glitter ! beautiful card!! love your camera!! Gorgeous card Lea! Love all the exciting layers! I love this challenge using a camera. I've never used one in a card before. How fun!! 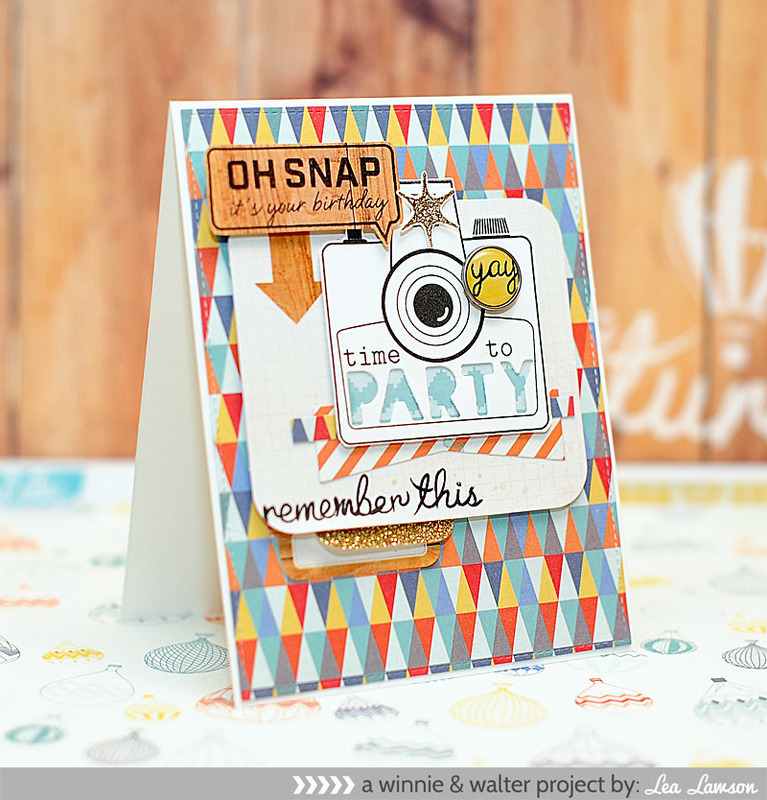 I love this camera trend, your challenge and "oh snap" your party camera card! How sweet is this camera card, filled with all kinds of pretty layers and papers...inspiration, indeed! Fabulous! So many cool layers. Love glitter! What fun and happy colours on this camera themed bday card! Wow I'm loving everyone's entries into this challenge. Great stuff! I need to get more camera type crafting goodies. Finally got to use one of my camera stamps! YAY!! THANK YOU, THANK YOU, THANK YOU Winnie & Walter for a super-fun week! and Star on the inside card.